Copy provided for blog tour in return for an honest review. If Fancy Nancy got angry. Really, really angry. Millie is quiet. Millie is sweet. Millie is mild. But the kids at school don't listen to her. And she never gets a piece of birthday cake with a flower on it. And some girls from her class walk right on top of her chalk drawing and smudge it. And they don't even say they're sorry! So that's when Millie decides she wants to be fierce! She frizzes out her hair, sharpens her nails and runs around like a wild thing. But she soon realizes that being fierce isn't the best way to get noticed either, especially when it makes you turn mean. So Millie decides to be nice--but to keep a little of that fierce backbone hidden inside her. In case she ever needs it again. 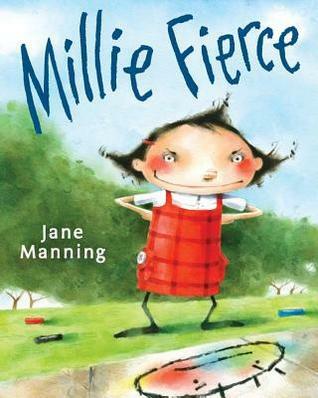 With bright art and an adorable character, it's easy to empathize with Millie. Because everyone has a bad day, once in a while. 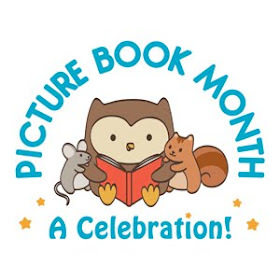 Bullying is such a big issue that there are more and more books coming out about it, both fiction and nonfiction. Some of those titles are told from the bullies perspective but the majority are told from the perspective of the victim. This book is told not only from the bully's perspective but it shows one way that bully's can be created. As I read this story about Millie and how overlooked she was until she became 'fierce' and started behaving badly, I immediately thought of some of the children that I work with and why they sometimes act out. Everyone needs to be noticed in a positive way and if it doesn't happen, sometimes people behave negatively in order to receive any attention at all. This is very true at school and undoubtedly true elsewhere as well. I thought this story was told very well, in a straight-forward manner with no excuses. This kind of book can very easily become didactic, which I really dislike, but this book doesn't fall into that trap. The story is simply told leaving the reader to decide what they think of Millie and her choices. 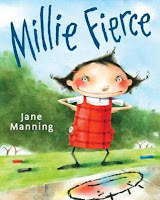 The illustrations are striking and the changes in Millie's demeanor and actions are very clear. I also appreciated that the story also reveals how other people's actions change based on how Millie behaves. A lot of times it is easy to forget just how much our own behavior effects those around us. I highly recommend this story to not only teachers but to anyone who wants an interesting and thought-provoking, discussion worthy picture book. Thanks for your review of my "Millie Fierce". Great insights!